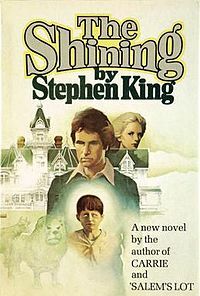 Despite being an avid horror fan, I’d not read Stephen King’s The Shining until now. A shame, I know. What I discovered after I finished the novel is that I love the book far more than the movie. It’s not that I don’t like the movie, I love it as well, but the depth of the characters and the story are better in King’s version. I’m biased towards the written word, however, because it’s through text that an author can put the reader far deeper into the minds of the characters, and present material in a way that’s not possible through different media. Jack Torrance is surprisingly different in the book compared to Kubrick’s interpretation. Why this surprises me is Kubrick is good at showing the depth of his characters in movies, yet I feel compared to the book, Kubrick’s Jack Torrance is not as well developed. That may also be simply because it’s hard to see Jack Nicholson as normal to begin with, but still. In King’s novel, Jack is haunted by the ghosts of the Overlook Hotel as well as his own personal demons. He’s not a father I would want, but he does occasionally show affection for his family; an example of this comes at the end when Jack manages to gain some control over himself, and when he does, he tells his son to run and get away from him and the hotel. It’s not a long display of affection, but it does show that Jack has a least some humanity in him. The supernatural elements are more pronounced in the book compared to the movie as well, and this may be due to King being able to delve into the minds of the characters more so than an exterior camera can. The internal turmoil Danny experiences, and his shock to discover he isn’t alone in the world has a greater emotional impact than in the film. Personally, I love books that explore the supernatural, so Danny’s story interested me. Most of my own writings have some sort of supernatural element to them–probably three stories out of five, one of five being reality-based horror (occasionally a different genre), and the last being literary. Because of my fascination, Danny discovering and accepting his powers produced a more interesting character for me. I will have to say that I occasionally felt the book was a little slow, but I won’t say that it is boring at all, which, for a 600+ page novel, is awesome. I read with interest throughout the entirety, and it reminded me why I am such a fan of Stephen King. No, not all his books are perfect, but The Shining may be an example of one that comes fairly close.